Added song preview: Click any song, anywhere to play the song. Playlist editor: Added buttons to collapse all / expand all categories, making it easier to navigate. Playlist editor: Add category to playlist - adds all songs in a category to currently active playlist. Hiscores: Your best scores will now be displayed, and you can replay song by clicking on it. HUD: Made it slightly better? I hope. Added a widget to display your name, in preparation of showing your position in comparison with other players. 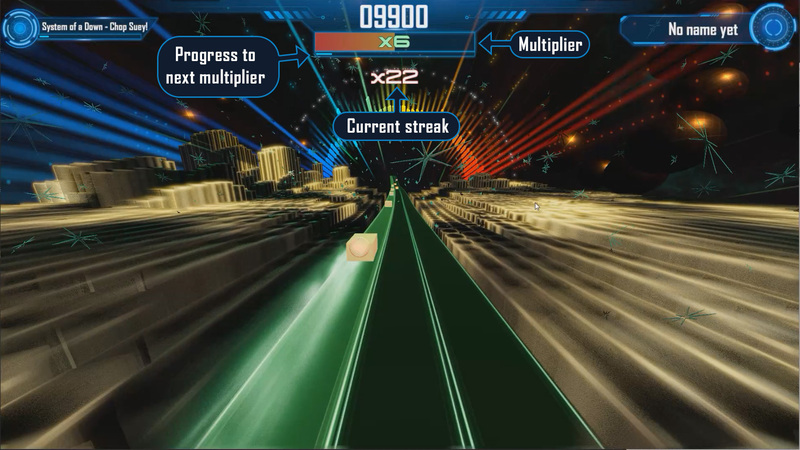 HUD: Added a multiplier bar which shows how much the score is being multiplied. The goal is to keep it high, and I feel this is easier to glimpse with your peripheral vision than text. HUD: Added a bar which shows the progress towards a higher multiplier. Pause menu: Return to main menu, restart level or resume. End of game stats: See how well you performed. Difficulty level now also affects the score.